There are signs that the autumn season is getting closer. 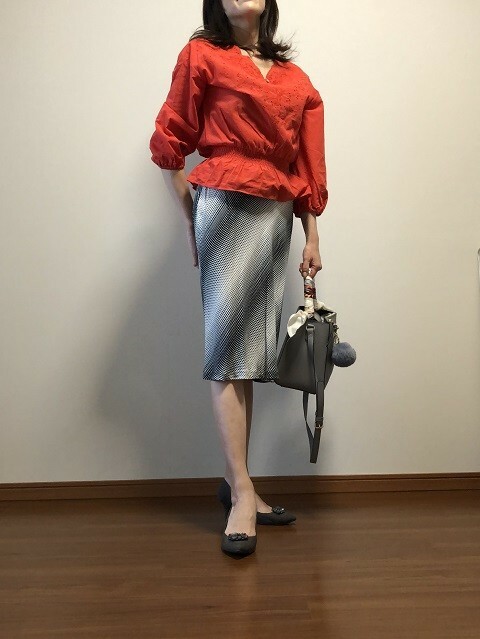 Although it is not practical to wear thick clothing yet, I have tried a few autumn coordination. Along with the right colors and accessories, I’ve tried to make a well-balanced full coordination, and with the GU, that wish can come true at a reasonable price. 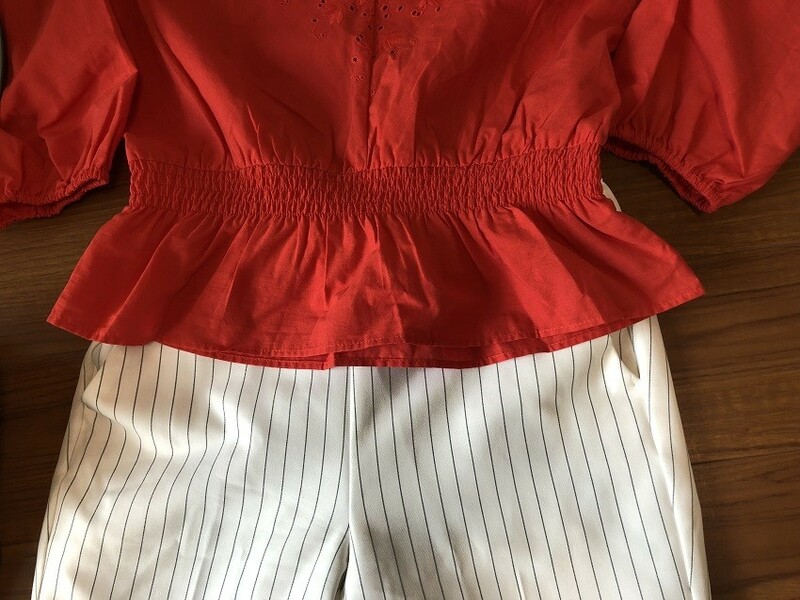 The red laced blouse has a design that makes the waist looks thinner by tightening only the waist area and the three-quarter sleeve has an effect that makes the arm looks thinner. The white striped tapered pants have a thin hem which exposes some parts of the ankle and the striped pattern helps to make the leg looks thinner. When you are going on a travel or an outing where there might be opportunity to take pictures, grab the spotlight with this combination!This time I want to bring your attention to the ZARA bag. Just by rearranging it with a scarf and a fluffy key holder you can get a very luxurious looking bag! Rather than fitting red with only black skirts, I think fitting it with white skirts looks better. Red is often thought as a color that is hard to match with other colors, but it has a very strong impact which can bring out your personality easily. The main lead of this coordination is the red which is why I don’t really recommend other flashy combination. By the way, the ZARA’s skirt is 3900 yen. So, how is it? Your overall image has changed drastically right? Even with just GU, you can get a luxurious feel from the way you dress up. For those who are interested in my next coordination, please post in the comments and let me know which combination you would like me to do!